Hi, I have this week downloaded Portfolio Slicer and also Power BI. So I am brand new to both. What I have seen of your work and the software I can see great advantages for me. I have been running my portfolios in excel and have been extracting performance / tracking from this data base. I had not found other commercial solutions that were able to emulate my objectives. So having seen what you have prepared I am excited about this as an improvement to my process. I have entered some of my earlier data and after some toing and froing I am comfortable with this aspect. I am trying to use this data to create a visualization to simulate what I have done in excel. Examples are in the attached pdf files After a few attempts I am not achieving an outcome. Are you able to guide me here. I have tried copying and then modifying the visulaisation on your "Daily Movment" tab which is showing "Total value of investment" - but withoutr luck. Let me know if this is too big an ask. I know that I could spend a day or 2 and possibly not get where I need to - but possibly then throw my hands up and say it is too hard. What you are trying to do requires one more Date dimension Date2 that is not in current structure. You need that extra Date2 dimension to specify from when to start calculating accumulated profit. As you can see in DATESBETWEEN function second argument for Start date is Blank() - that means - start of the Date dimension. If you would have Dates2 dimension, instead of the Blank() you would use Dates[Date] value calculated based on Dates2 selection. If you know PowerBI or PowerPivot and DAX, then you could create what you want with DAX and small structural change. One more option that you have - create simple PivotTable with Monthly profit, then use Excel functions/Pivots to create your reports out of that PivotTable results. I have made head way. Can you advise whether the data is stored on a daily basis or is it monthly other than in the past month or so. I see that the quotes are in two files, e.g _A2M.AX_ - this file has daily from Jan 1, 2018 but prior to that the quote is saved on a monthly basis. The second file _A2M.AX__Archive has data on a daily basis. So I am presuming the excel worksheet is accessing only the "_A2M.AX_" file. If possible I would like to access the daily movements - what are the implications here? Portfolio Slicer uses daily quotes for last 40 days and monthly quotes before that. This is done just for performance reasons - less quotes makes refresh faster. So, by default, when file quotes.csv is created you have daily quotes for last 40 days and monthly before that. But Portfolio Slicer scripts save daily quotes, so it is very easy to switch to load all daily quotes. Simply in psConfig.txt change parameter IncludeQuoteArchiveFolder value from "No" to "Yes" and recreate quotes.csv (run .bat file) and then refresh Excel - and you will have all daily quotes. As I said implication - just slightly longer refresh time. Test refresh time before parameter change and after and you will know if impact is big. Hi Vidas, I am continuing to work my way through the visualizations that I would like to have in my Power BI and I am now back to the visualization that I initially raised in this thread. Refer to file Accumulated profit by year (1).pdf reattached. I am now trying to introduce my Profit targets. What I have done is introduced a worksheet "ProfitTarget" in to PortfolioSlicer excel worksheet. From there I have tried various processes, but essentially I have no idea how to achive the outcome of have my Targets overlaid on my * Profit YTD [3 years] tab. Attached to this post are example data in the excel model that I am using with example data. As I said above the excel file is your current version 2.4.04 . 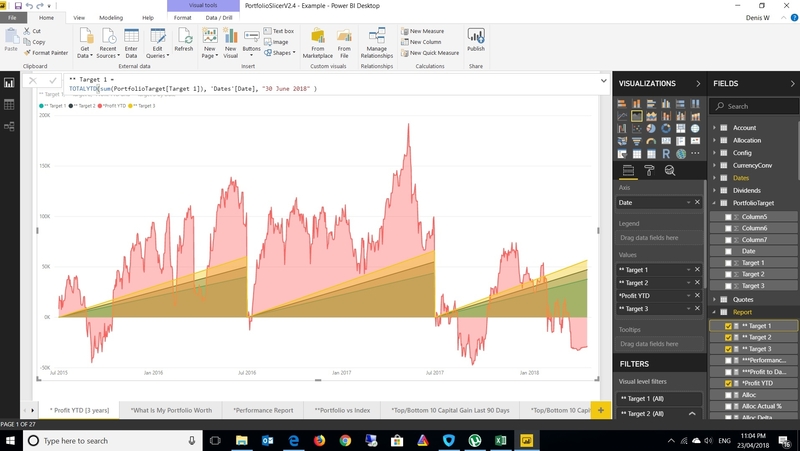 Are you able to guide me on how to introduce Target 1 and Target 2 to my * Profit YTD [3 years] tab in PowerBI. CNH - I do not understand what you want to do. How do you want to calculate Profit Target? Currently there are formulas that calculate Profit Target based on another symbol - "Expd REturn % (Alloc)" and "Expd Return % (TMTR) - can you use similar logic? The profit target is an "aspirational" $ target that I am setting at the beginning of the year. If you look at the excel spreadsheet I have established 3 targets, one conservative, one aggressive and one mid point. These are detailed numerically by date in worksheet "PortfolioTarget" in PortfolioSlicerV2.4-XL16.xls. So what I am trying to show is if, on a day to day visualisation, whether I am meeting this $ aspiration. Having said that, it is a personal vision for my portfolio. So in short is there a way to take this dataset from Portfolio Slicer [the data set in the new worksheet that I have added to PortfolioSlicerV2.4-XL16.xls] and display it on my Portfolio BI tab "*Profit YTD [3 Years]" which is currently showing the profit as defined by measure"*Profit YTD"
As I have said this is something that I have on my old portfolio excel monitoring spreadsheet that I am hoping to now be able to do on your Portfolio Slicer. I have now achieved the outcome I am after. One of the issues I had was I was using a line chart, I have changed this to an area chart and with new measures defined all seems good. I will look further at this tomorrow with actual data rather than sample data and see whether my expected outcomes have been achieved.